Summary: A paper published today describes the discovery of two new baryons, predicted to exist but never before seen. 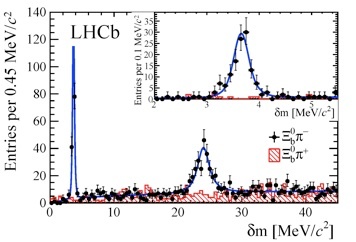 The mass difference spectrum: the LHCb result shows strong evidence of the existence of two new particles the Xi_b'- (first peak) and Xi_b*- (second peak), with very high- level confidence of 10 sigma. The black points are the signal sample and the hatched red histogram is a control sample. 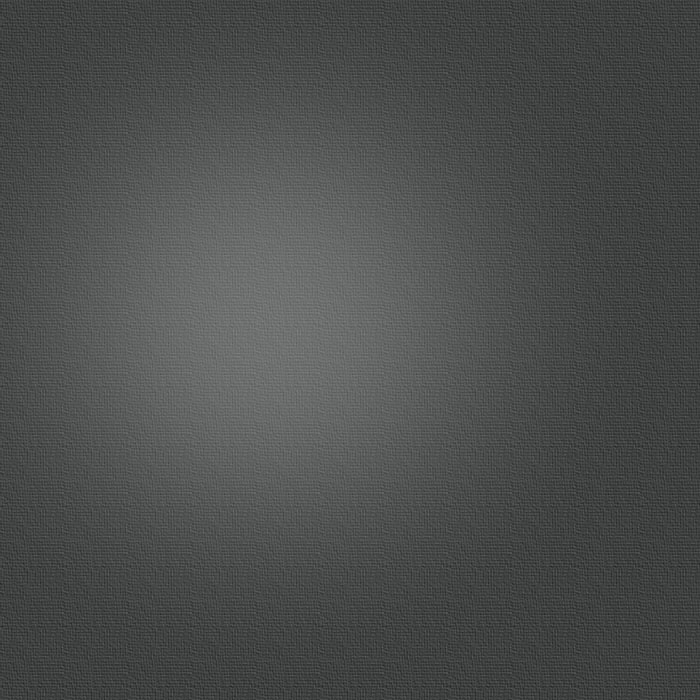 The blue curve represents a model including the two new particles, fitted to the data. INSET: Detail of the Xi_b'- region plotted with a finer binning. Today the collaboration for the LHCb experiment at CERN’s Large Hadron Collider announced the discovery of two new particles in the baryon family. The particles, known as the Xi_b'- and Xi_b*-, were predicted to exist by the quark model but had never been seen before. A related particle, the Xi_b*0, was found by the CMS experiment at CERN in 2012. The LHCb collaboration submitted a paper reporting the finding to Physical Review Letters. Like the well-known protons that the LHC accelerates, the new particles are baryons made from three quarks bound together by the strong force. The types of quarks are different, though: the new Xi_b particles both contain one beauty (b), one strange (s), and one down (d) quark. Thanks to the heavyweight b quarks, they are more than six times as massive as the proton. But the particles are more than just the sum of their parts: their mass also depends on how they are configured. Each of the quarks has an attribute called "spin". In the Xi_b'- state, the spins of the two lighter quarks point in opposite directions, whereas in the Xi_b*- state they are aligned. This difference makes the Xi_b*- a little heavier. "This is a very exciting result. Thanks to LHCb's excellent hadron identification, which is unique among the LHC experiments, we were able to separate a very clean and strong signal from the background," said Steven Blusk from Syracuse University in New York. "It demonstrates once again the sensitivity and how precise the LHCb detector is." As well as the masses of these particles, the research team studied their relative production rates, their widths - a measure of how unstable they are - and other details of their decays. The results match up with predictions based on the theory of Quantum Chromodynamics (QCD). QCD is part of the Standard Model of particle physics, the theory that describes the fundamental particles of matter, how they interact and the forces between them. Testing QCD at high precision is a key to refine our understanding of quark dynamics, models of which are tremendously difficult to calculate. "If we want to find new physics beyond the Standard Model, we need first to have a sharp picture,” said LHCb’s physics coordinator Patrick Koppenburg from Nikhef Institute in Amsterdam. “Such high precision studies will help us to differentiate between Standard Model effects and anything new or unexpected in the future." The measurements were made with the data taken at the LHC during 2011-2012. The LHC is currently being prepared - after its first long shutdown - to operate at higher energies and with more intense beams. It is scheduled to restart by spring 2015. Dr. G. Cowan, LHCb-UK physics coordinator, commented "This is a very interesting new result, confirming the existence of these particles that have long been predicted. By making precise measurements of their properties, LHCb physicists will be able to test the fundamental theory of the strong interaction (QCD) in new ways, one of the key goals of the research that we are performing at the LHC." More information can be found in the LHCb paper on the arXiv.